Current: What is a Sprint Goal in Scrum? A Sprint goal shows the desired outcome of an iteration that provides a shared goal to the team, which goal has to be defined before the team starts the Sprint in order to focus to get this goal. On the ideal situation, every sprint should have one goal. This ensures that everyone is in the same page. When the goal has been chosen, the team have to work to implement it. 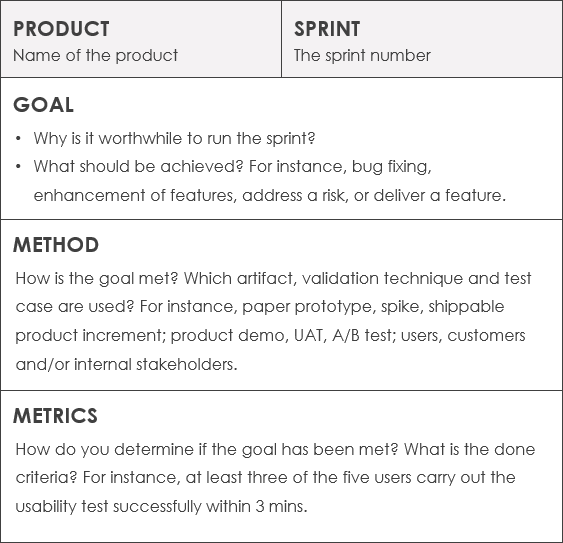 First of all, the Product Owner has to define clearly the objective (or goal) of the Sprint. Then the team has to implement it in order to build a “Product Increment” and last but not least the stakeholders have to validate the goal and provide their feedback. What is a Sprint Goals? 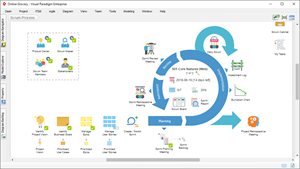 Sprint goal is a high-level summary of the goal the product owner would like to accomplish during a sprint, frequently elaborated through a specific set of product backlog items. A sprint goal is a short, one- or two-sentence, description of what the team plans to achieve during the sprint. It is written collaboratively by the team and the product owner. Metrics to determine if the goal has been met. It additionally provides a header section that allows you to state to which product and sprint the goal belongs, as the picture below shows.